The cause of the several-months-long 4T Genuine Stella delay is revealed thanks to FOIA request. The emissions stickers weren’t sticky enough, and the idle mixture screw wasn’t sufficiently tamperproof. I don’t know if “Epoxy coating” means they were supposed to glue them in place, or if that’s referring to the dumb plastic cap that covers the 1/2″ hole in the airbox (Nevermind, looking at my photos of the prototype, the 4T carb isn’t inside the airbox), but either way, that seems like a pretty minor issue. And honestly, that screw is there because it sometimes needs to be adjusted. I applaud the U.S. and California governments for looking out for our security, safety, and ecological future. I’m absolutely glad they’ve ramped up enforcement. But they basically screwed Genuine here, badly, after ten years of letting anything with two wheels enter the country. The real irony? The pollution created by shipping these buggers back to India and back (1000+ scooters, by land and sea) has a measurable environmental impact that surely outweighs the infraction. But that’s (mostly) outside the U.S., so who cares, right? Way to save the earth! Props to Ralph for taking the trouble to find out instead of speculating on the boards for four months, like the rest of us. Author illnoisePosted on 24.09.10 24.09.10 Categories 100mpg?, Genuine (LML/PGO), Green Scooters, Legal & Safe3 Comments on Your Government at Work? Suzuki’s Burgman Fuel Cell Scooter is being tested in a small town in Leicestershire this month with plans for London tests later in the year. The current issue of Scoot! Magazine features an ad from GP200.net promising an “All-Electric GP200e” with a photo of a vintage Lambretta GP. The link redirects to Wheego.net, which features absolutely no info on the scooter. Wheego is an electric car company that like most electric car companies seems to have already hyped their vehicles profusely, then missed a few self-imposed deadlines. Wheego is apparently backed by EarthLink founder (and ex-Mobil-exec) Mike McQuary, whom I will never forgive for the hour-plus I spent on the phone cancelling my EarthLink account, but my distrust of this endeavor goes beyond that experience. Author illnoisePosted on 20.08.09 20.08.09 Categories 100mpg?, Concepts/Innovation, Featured Stories, Green Scooters, Lambretta8 Comments on Electric Lambretta GP? This Dean Kamen Scooter Thingy is making headlines worldwide. I hate to give the guy more buzz after the whole “It/Ginger/Segway” joke* but you might be interested. We just learned the MP3 Hybrid is now rolling off the assembly line and will retail in Europe for under €10,000 ($US14,125). Earlier today, Piaggio presented MP3s to Italian Prime Minister Silvio Berlusconi and other officials and released some new photos (below). Author illnoisePosted on 29.05.09 31.05.09 Categories 100mpg?, Featured Stories, Green Scooters, Photo, Piaggio1 Comment on MP3 Hybrid: In production? For more than a year, rumors have been circulating about a new 4-stroke version of Genuine Scooter Company’s Stella motorscooter. Genuine confirmed the model a few months ago, but has otherwise been very quiet about the project. This week, Genuine allowed 2strokebuzz a quick look at a “New Stella” prototype (and a ride!) just before it was sent for CARB testing in California. Author illnoisePosted on 29.04.09 29.04.09 Categories 100mpg?, Concepts/Innovation, Featured Stories, Green Scooters, Piaggio, The Biz, Vectrix, Vespa9 Comments on Plug in, 2006-style! 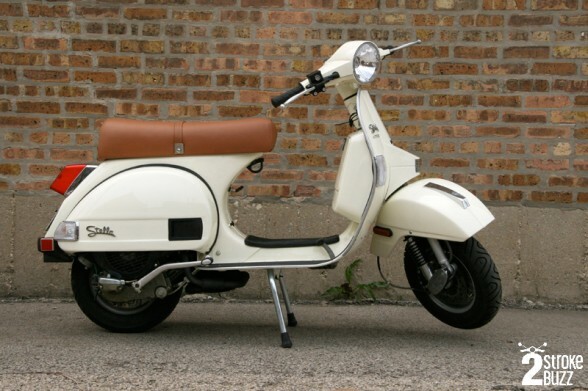 We mentioned last spring that MotorcycleUSA was planning on commuting on a Vespa for a few months to see if PiaggioUSA’s “Vespanomics” held up. We just noticed they posted their conclusions last December, which match what we’ve been saying all along: It’s hard to justify the cost of a new scooter (including maintenance, insurance, and) if you already own a car, but it’s a great substitute for a new car or second car, for a single person without kids. They didn’t really explore the ecological benefits, which are usually overstated, but worth mentioning, but they do mention that it’s a fun way to get around, which we think is the biggest selling point of a scooter. It’s definitely Vescony, but it’s 1964 NOT 1961. It’s a Carl Alley produced commercial. Several were produced, but Piaggio would not share in any of the costs for airing them. They were never shown nationally, but some of the larger dealers showed them locally during non-primetime. In general, they were way too expensive to be shown even at off times. I saw one only once for my local dealer during a Saturday afternoon movie re-run. If Piaggio had enough sense to underwrite serious advertising in the U.S. things might have gone a lot different for them. An update to the rumors we posted last week: Genuine has photos of the new Buddy Blackjack 150 and Eco 125 on their site. And we have a little more information to talk about. Via Steve, a nicely-done Australian Yamaha TV commercial showing the economical aspects of their scooters. Genuine and even PiaggioUSA are working on pretty limited budgets, but you have to wonder why Yamaha and Honda, who actually do run national spots on cable TV, haven’t done anything like this here in the U.S. yet. If it wasn’t for the Australian coins shown at the end (and if they added a few models to their lineup), they could even run this one.